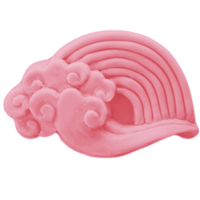 This Hot Air Balloon Soap Mold features a classic hot air balloon design with a wicker basket hanging beneath. Go up, up and away with this soap mold! Bar Depth: 1.5" Bar Length: 3.375"